A dozen US states have been warned to brace themselves for more extreme weather as many regions struggle to recover from the impact of the latest round of thunderstorms and tornadoes. People who have planned holiday or business trips to the affected parts continue to face a high risk of potential travel insurance claims arising from storm-related flight delays and disruption. US weather officials have issued warnings of tornadoes and severe thunderstorms for an vast area extending north west from Texas to Ohio. A series of weak tornadoes touched down in Missouri and Indiana on Wednesday, but there were no reports of injuries. 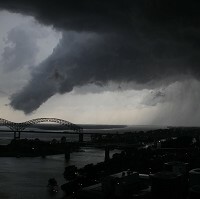 In Memphis, Tennessee, tornado warnings sounded as heavy rains and hailstorms lashed the city early in the morning. On Tuesday storms killed 15 people across Arkansas, Oklahoma and Kansas. But the worst single tornado in the US since 1950 claimed 125 lives in Missouri's Joplin city on Sunday. At the Kentucky office of the National Weather Service, chief meteorologist Beverly Poole said: "Everybody's working as fast and furious as possible. This is just a wild ride."